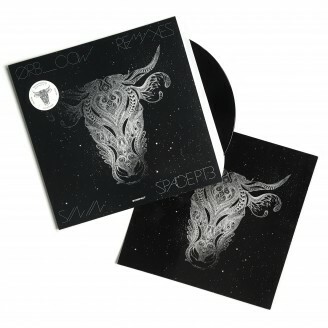 We continue THE ORB's SIN IN SPACE remix EP series with a third volume focussing on the duo's latest full-length, the highly acclaimed COW / CHILL OUT, WORLD! (KOMPAKT 354 CD 134). The spontaneous, organic vibe and sample artistry of the album is reflected in three distinct reworks from highly respected Kompakt mainstays THE FIELD, DAVE DK and JÖRG BURGER - all of them informed with surprising twists and displaying a clear lineage to the source material. THE FIELD's remix of 9 ELMS OVER RIVER ENO takes the original's percussive part and unfolds it to a swirling, tropical epic that alludes as much to The Orb's multifaceted sound collages as it does to the hypnotic, looping flow of The Field's own output. Meanwhile, DAVE DK turns in a club-friendly revamp of 4AM EXHALE with the fittingly titled ACCELLERATOR MIX, indulging in exquisitely lyrical glitches and the magic of the straight bassdrum. JÖRG BURGER takes a shot at the beatless 5TH DIMENSIONS with the excellent DSCHUNGELOPER MIX - its loose pop jam feeling and flirty shuffle rhythm recall Burger's lush lounge core efforts under his Triola monicker.